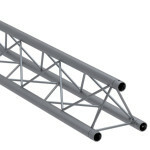 Cosmic Truss F23 is a triangular high strength truss system that combines lightweight and high capacity. The triangular construction provides optimum strength and loading capacity for its size, with a standard tube diameter of 35mm (1.37 inch). Section pieces connect together using a conical coupler, which is then secured with a locking pin, and a further safety clip for added security.